Scientists in the BONUS SEAMOUNT project have discovered a new submarine groundwater discharge (SGD) site in Hanko Peninsula, south Finland. It is the third documented SGD site in the Baltic Sea, following Eckernförde Bay in Germany and Puck Bay in Poland. Submarine groundwater discharge (SGD) is recognized as a significant but so far poorly understood source of nutrients and other potentially harmful substances to the coastal sea. The poor ecological status of the Baltic Sea requires improved understanding of the supply routes of various substances to the sea, including SGD. Stratigraphical architecture of the studied submarine groundwater discharge site (Dr. Joonas Virtasalo). Now, one more site with SGD has been identified by scientist from the SEAMOUNT team, which makes it the third confirmed location in the Baltic Sea. The new SGD site was found by multibeam bathymetric and side-scan sonar surveys of the seafloor, carried out at Hanko Peninsula during the summers 2017 and 2018, onboard the research vessel Geomari of the Geological Survey of Finland (GTK). The team identified two active spots of groundwater flowing out from the seabed, which is marked B and D on the map above. A third site, marked E, had previously been active, but was now covered with organic rich mud and other material. “An educated guess led us to survey that locality, but we were not sure what to expect because submarine groundwater sites had not been documented before in Finland. It was quite a surprise to find one large pockmark after the other, and very nice to identify two of them as SGD,” says cruise scientists Dr. Joonas Virtasalo. Pockmarks are crater-like depressions on the seafloor, which are often caused by gas seepage but may also result from SGD. Joonas Virtasalo tells, that he noticed more than twenty pockmarks up to 25 meters wide and 2 meters deep in a comparably small area at the water depths between 10 and 17 meters and approximately 200 meters from the shoreline. 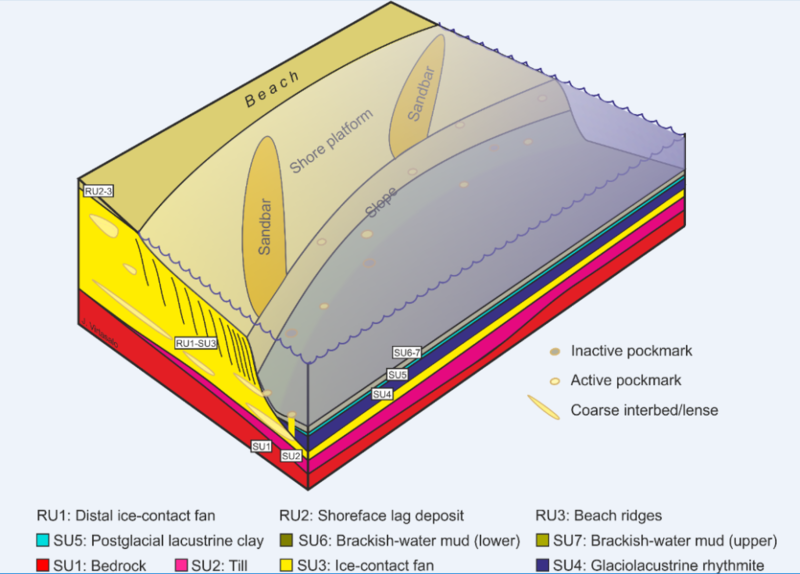 The aquifer and pockmarks are hosted in the distal part of a subaqueous ice-contact fan, which is part of the First Salpausselkä ice-marginal formation. The distal part of the fan is predominantly composed of fine sand with moderate hydraulic conductivity. Coarse sand interbeds and lenses in the fan deposits, and, potentially, sandy couplet layers in the overlying glaciolacustrine rhythmite, provide conduits for localized groundwater flow to the pockmarks, Dr. Joonas Virtasalo explains. To determine whether the identified pockmarks were created by groundwater discharge, Dr. Joonas Virtasalo measured the radon concentrations in the near-bottom water just above each pockmark, using a flow through system in collaboration with Dr. Jan Schröder and Dr. Jan Scholten from Christian-Albrechts-Universität zu Kiel. Radon is a gas that builds up in groundwater, while there normally is very little radon in seawater, which makes finding elevated radon concentrations at sea a strong indication of groundwater influx. 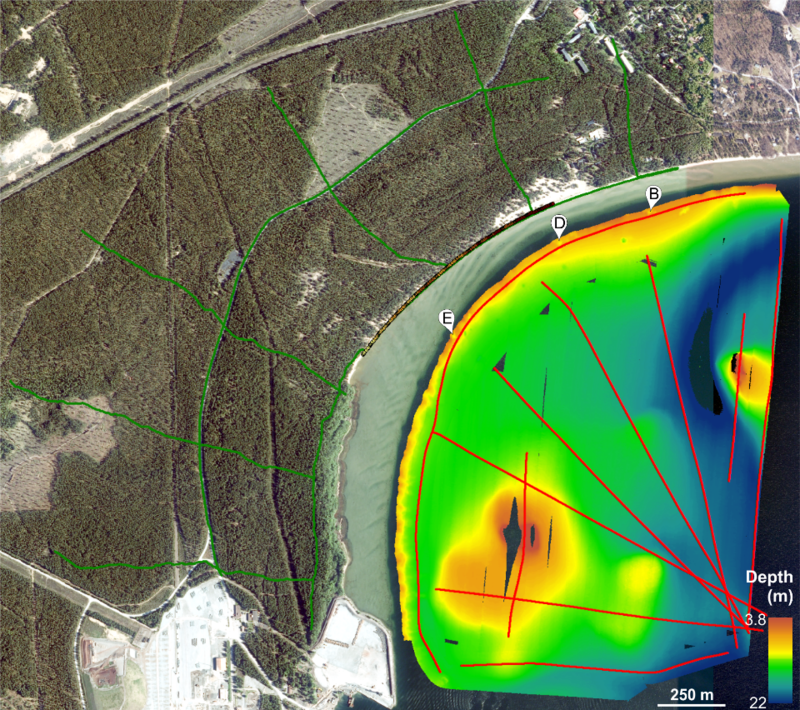 The local stratigraphy and aquifer geometry of the Hanko SGD site were studied by marine seismic surveys, and by ground-penetrating radar and refraction seismic surveys on land. The sub-bottom profiles acquired by the different survey methods were correlated on the basis of significant unconformities, following the allostratigraphical approach. This in addition with the radon measurements and the visual identifications, made the scientist able to conlude, that the bay of Hanko Peninsula did indeed contain both active and inactive pockmarks. The study has been published in an open-access scientific paper: Virtasalo, J. J., Schröder, J. F., Luoma, S., Majaniemi, J., Mursu, J., and Scholten, J. 2019: Submarine groundwater discharge site in the First Salpausselkä ice-marginal formation, south Finland. Solid Earth 10, 405-423, https://doi.org/10.5194/se-10-405-2019.